Over the past few years, many low volatility or “low vol” funds have emerged in both the Canadian and Global equity markets. On the surface, the concept contains many of the key points that investors are looking for such as: downside protection, lower risk, and low volatility. The question is are these just words or are there facts to back up the idea that one can create a fund with lower volatility and comparable returns over the long term? What is immediately clear is that some sectors are significantly more volatile than others and that returns vary significantly between the sectors. Four sectors underperformed the S&P/TSX over the 15 year period: Energy, Materials, Health Care, and Technology. Interestingly, the sectors with the greatest volatility over the same time period are Energy, Materials, Health Care and Technology. Having said that, keep in mind that this is a Point A to Point B analysis without any regard of what happened in between. Sectors such as energy have provided significant returns over shorter time periods but in the long run, it appears that investors need to be active in trading these volatile sectors rather than taking a buy and hold approach. To be clear, we are not saying to ignore these sectors completely as they can be fruitful in delivering outsized returns in short to mid-term time periods. By focusing on the sectors that have a history of outperforming with lower volatility, we believe that a low vol fund can be constructed to provide similar returns in the long term without the bumps in the road along the way. Investors need to think about the voyage and how they got there rather than just the end result. 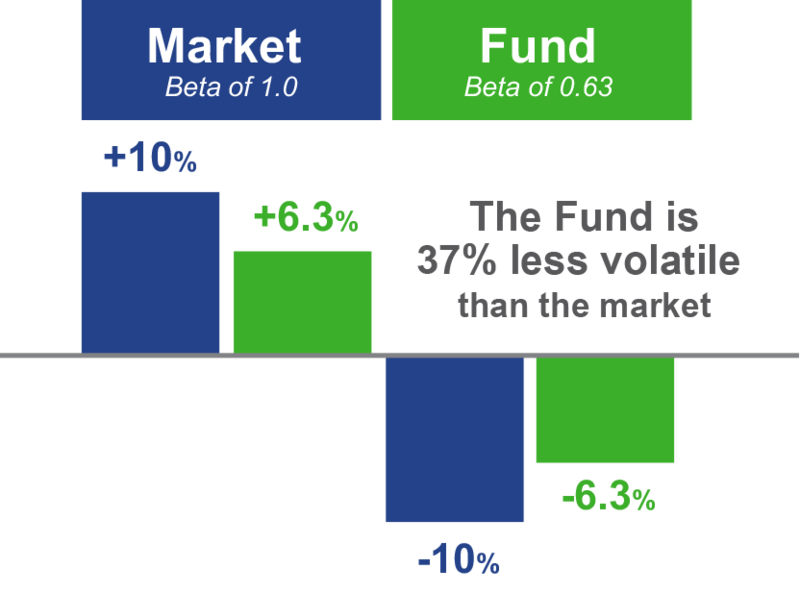 Now the question becomes, how do you construct a low vol fund? What should a Manager do in order to create a fund with lower volatility? The most obvious place to start when creating a low vol fund is to avoid, or at least limit, your exposure to the sectors that have lower long-term returns with increased volatility. The next thing one can do to reduce volatility is to establish a portfolio of stocks that have historically had lower volatility than the market. While volatility can change from year to year, most stocks with a long track record of having less volatility than the market can be relied upon to continue the trend. To compare the volatility of a stock to that of the market, the best indicator is Beta. See the chart below for an explanation of how Beta works. Another way to provide downside protection is to carry a larger than normal cash position. If you only invest 90% of the proceeds of the portfolio and the underlying stocks go down 10%, the fund will only go down 9% due to the cash drag. However, most managers prefer to be fully invested so they do not have to forgo some of their good investment ideas in order to hold cash that essentially returns 0% in this low interest rate environment. However, there is another way to increase your net cash position without forgoing your investment ideas: short selling. If a Manager typically invests 98% of their portfolio in long ideas, they are carrying a 2% cash position. If that same Manager continues to invest that 98% in long positions but offsets it with 8% in short positions of stocks they feel are overvalued, the result is a fund that is only NET 90% invested thus creating additional protection in the event of a market pullback. Short selling requires a different skill set and is traded differently than long positions so it is important to make sure that a Manager who is short selling in a portfolio has experience in the short market. Short selling is just another tool of active management. There are two ways to reduce your net exposure to the market in times of uncertainty. One is to sell long positions and the other is to net out some of your favourite ideas by shorting names you think are overvalued to reduce your NET exposure. In good times, you continue to hold your best ideas and in bad times, your have less market exposure to help with downside protection. In our years of experience, we have found that there is a sense of security and confidence that comes with owning stocks that pay dividends, more specifically, stocks that are increasing their dividends. Typically, companies that have a consistent track record of increasing their dividends have better visibility into the future of their company and thus usually have less surprises. Stocks that have continual surprises tend to have more volatility. Therefore, by owning dividend paying stocks, we believe that we are owning less volatile companies with greater visibility. One aspect of active management is that a fund is monitored and managed daily based on ever-changing market news rather than re-balanced back to a pre-determined target weight on a monthly or even quarterly basis. Investing in low vol funds that are actively managed may protect better as changing situations at the company level are dealt with immediately, rather than at the next re-balancing.